Check out this great new promotion! Spend $100 and receive this fabulous FREE (who of us doesn’t like free stuff???) product package! This great offer is only for the month of July. So phone me now to place your order, book a free demonstration, request a technique class OR join the ever increasing number of crafters hosting a stamp-a-stack. (10 cards (5 each of 2 designs) for $20) Bargain! One Spool of white 1/4″ (6mm) grosgrain ribbon with repeating flower designs. Almost 14 m worth! 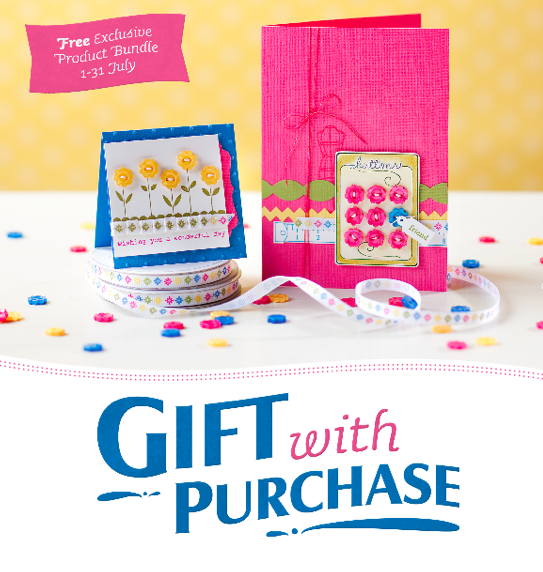 Spend $100 and receive an exclusive product bundle for free–a $31.95 value! Don’t need $100 worth of product this month? Team up with a friend and go halves in a $100 order and divide the product bundle between you!